Although some silver-bearing ores contain silver as their largest metal value, virtually none has silver as its main constituent. A typical ore might contain 0.085 percent silver, 0.5 percent lead, 0.5 percent copper, and 0.3 percent antimony. After flotation separation, the concentrate would contain 1.7 percent silver, 10 to 15 percent lead, 10 to 15 percent copper, and 6 percent antimony. Approximately 25 percent of the silver produced comes from ores actually mined for their silver value; the other 75 percent comes from ores that have as their major metal value either lead, copper, or zinc. All these ore minerals are sulfides; typically, lead is present as galena (PbS), zinc as sphalerite (ZnS), and copper as chalcopyrite (CuFeS2). In addition, the mineralization usually includes large amounts of pyrite (FeS2) and arsenopyrite (FeAsS). The silver mineralization is usually argentite (Ag2S), proustite (Ag3AsS3), and polybasite [(Ag,Cu)16Sb2S11]. Silver-bearing ores are mined by open-pit or underground methods and then are crushed and ground. Since virtually all the ores are sulfides, they are amenable to flotation separation, by which a 30- to 40-fold concentration of mineral values is usually achieved. Of the three major types of mineralization, lead concentrates contain the most silver and zinc concentrates the least. Gold has varying modes of occurrence in sulphide ores ranging from being disseminated and interstitial in minerals such as lead and copper, in oxide ores particularly as disseminated particles, and as free milling gold or association with tellurides. Where the gold is intimately associated with various sulphide minerals, especially iron sulphides which include pyrite, arsenopyrite and pyrrhotite, flotation recovery of the gold is dependent on recovery of the associated minerals. In this case gold follows the associated sulphide mineral recovery. Free gold flotation fundamentally is not possible because gold is a noble element which means it is a chemically nonreactive metallic. Since sulphide flotation collectors chemisorb to the target mineral surfaces, because noble metals do not react, collector adsorption on a pure gold surface is not possible. Use of cresylic based dithiophosphates does provide some collection of gold particularly in gold-silver ore flotation. Alternatively, if there is significant metallic gold association with silver metal, because silver has a reactive for collector bonding, collectors for silver indirectly also result in gold recovery. 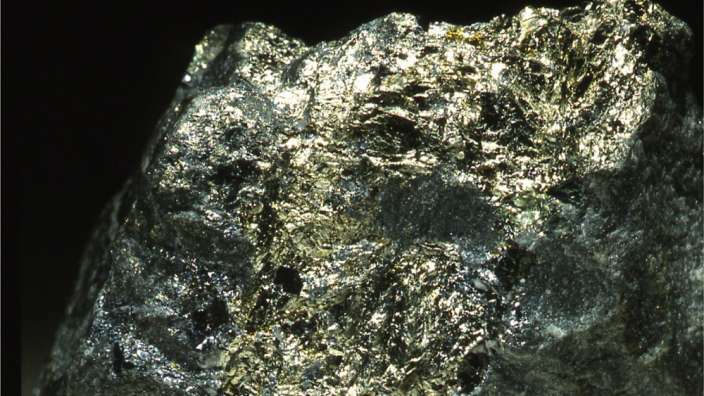 Consequently, gold flotation recovery requires a focus on floating the associated base metals (predominantly lead, copper) and often pyrite minerals. While lime is often used in base sulphide mineral flotation, because excess lime also tends to depress gold flotation, a balance must be maintained between good base metal metallurgy and gold recoveries. Natural pH is recommended for gold flotation. Alternatively using soda ash for pH adjustment can reduce gold depression. Realgar is an oddball among the sulfides. It is one of only a few sulfides that are not metallic or opaque or blandly colored. 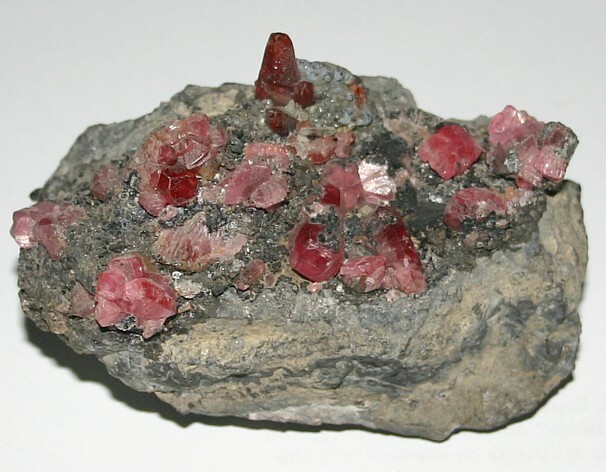 Its structure is analogous to that of sulfur and resembles sulfur in most respects except for color (the name “ruby sulfur” has been applied to realgar). Sulfur has a structure composed of 8 sulfur atoms linked in a ring. Realgar’s structure alternates between sulfur atoms and arsenic atoms producing rings of As4S4. The arsenic atoms affect the structure altering it from sulfur’s orthorhombic symmetry to realgar’s monoclinic symmetry. Realgar occurs in hydrothermal veins with valuable metal sulfide ores and its bright red color can be an aid to prospectors. It also can be found in hot spring deposits and as a volcanic sublimate product (crystallizing from vapors). 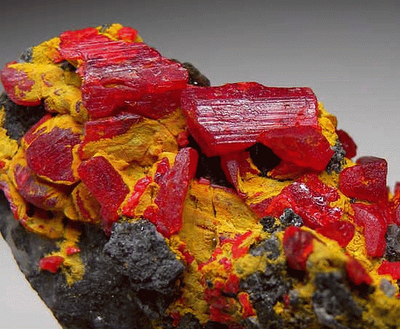 Realgar gets its name from the Arabic words for “powder of the mine” (rahj al ghar). Realgar is famous for some wonderfully beautiful specimens. Some specimens can have a deep ruby red color with an amazing clarity and a high luster. The color of realgar is truly something to appreciate and cherish. But realgar’s beauty is sometimes fleeting. It is an unstable mineral and will alter to a different mineral, pararealgar and eventually to a powder. This process takes time and is accelerated by exposure to light. Specimens should be stored in dark, enclosed containers, and only exposed to light for the brief enjoyment of its owner and friends. This sounds extreme, but wonderfully beautiful realgar specimens are worth preserving for as long as possible. If you are wondering how quickly the deterioration occurs, the answer is immediately, but fortunately very slowly. Ancient Chinese carvings of realgar are still in existence, but badly affected by the deterioration. The deterioration of realgar was thought to produce the closely related yellow orpiment, but this was recently proven to be false and the deterioration product is in fact yellow-orange pararealgar. In old paintings and manuscripts, realgar was a common pigment for paints and dyes. Many of these paintings now have a yellow or orange hue where once the color must have been an original red. The main copper sulphide minerals are chalcopyrite (CuFeS2) chalcocite (Cu2S), covellite (CuS), bornite (Cu5FeS4), tetrahedrite ((Cu,Fe)12Sb4S13) and enargite (Cu3AsS4). The largest source of copper is from porphyry ore deposits in which one or a combination of the aforementioned minerals occurs. A typical copper sulphide ore contains various levels of iron sulphide types that generally include pyrite (FeS2) and pyrrhotite (Fe1-xS). Often gold and silver are present which may either be associated with the sulphides or are free. The gangue particles can consist of a range of silicate minerals from quartz to talc and clays. Carbonate mineral gangue can also be present. Antimony sulfide, Sb2S3, a mineral, silvery gray in color, with a metallic luster. It crystallizes in the orthorhombic system. Found in many parts of the world, it is the most important ore of antimony. It is commonly deposited by alkaline waters and occurs in association with quartz, calcite, sulfides of the base metals, arsenic, gold, and silver. 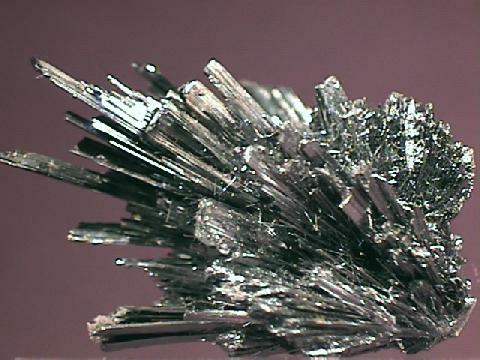 Known in ancient times, stibnite was used in powdered form by women to darken their eyebrows and eyelashes. Antimony is used in alloys for type metal, storage batteries, pewter, babbitt, and antifriction metal for bearings. Its compounds find use in explosives, matches, and fireworks, in vulcanizing rubber, and in medicine as an emetic. There is a metal that no one knows much about, Tellurium. Go to “links”, “periodic table of elements”, and you will find all the chemical characteristics of this element. It is a metal with a lot of chemical properties similar to gold. No, it’s not a precious metal, but it does have a unique property. It forms natural salts (complexes) with gold. Some of the most valuable gold ores that exist are in the form of Tellurides. Yeah, I know, someone told you that gold was inert, it doesn’t combine with anything in nature. It only occurs as the elemental metal, GOLD. Well, as usual, they told you wrong. I’m sure they believed it, their best buddy told them, so it must be true. The buddy only had hearsay evidence, old wives tales. We Basement Chemists only believe the tales that can be substantiated. Sure we all know that there is gold dissolved in sea- water as the salt, gold chloride. True, but the amount is so small that, for our purposes, it can be ignored. We ain’t gonna get rich on that. I know someone is going to say, ” gold comes, in nature, combined with mercury, silver, copper, etc, I find it all the time. 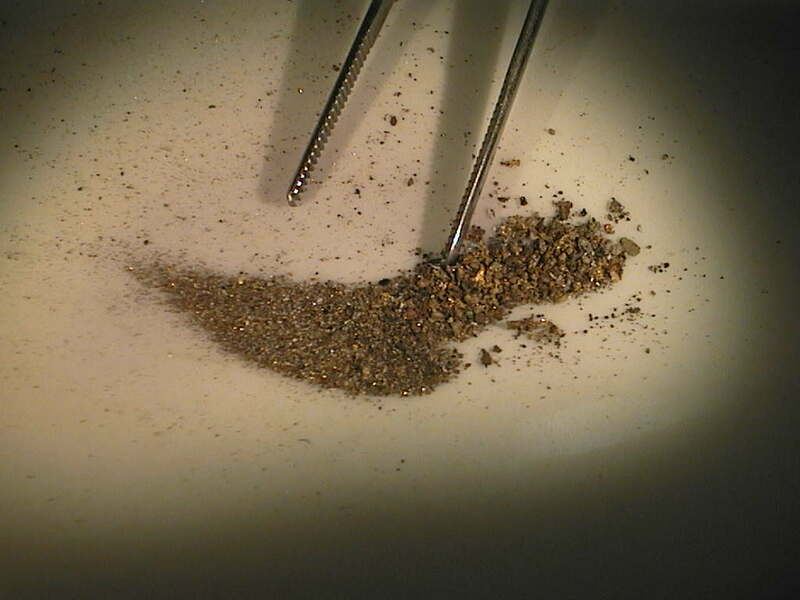 These amalgams that we all find once in awhile, are not “combined”. they are not another chemical. They are not salts of gold, mercury, silver, or copper. They are simply mixtures of gold, silver, copper, and mercury. They have not chemically reacted to form another compound. OK, so what the hell is a Telluride anyway? Well, as Basement Chemists you should have caught on by now that when a chemical name ends in “ide” it means that it is a salt. The things are chemically combined, not just mixed or dissolved in each other. Hydrogen sulfide is not hydrogen dissolved in sulfur. It is hydrogen reacted with sulfur to produce a completely different chemical. If not, you could simply warm the hydrogen sulfide and it would boil off hydrogen and leave sufur behind. It don’t work that way. They are reacted to form a chemical that is not hydrogen nor sulfur. It’s a completely different thing. Tellurium, gold, and silver (and other metals) can react to form Tellurides. Why are they not called “goldides”? Don’t know. I think it just don’t sound as good. Actually, it is because you can have tellurium/silver, tellurium/gold, or tellurium/silver/gold. You cannot have silver/gold. That is an amalgam, a mixture, not a compound.